You may have seen acoustic artist Angie Miller performing her original music at clubs, coffeehouses, festivals, and colleges throughout the mid-Atlantic region where she has carved out her reputation as a performer and songwriter who knows "how to capture an audience," as washington post's Maria Villafana says. 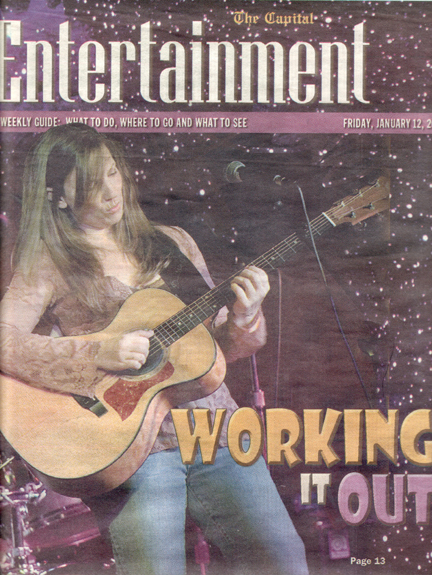 Angie currently hosts a songwriter showcase in Annapolis – “Second Monday at 49 West” – and loves being able to celebrate the wealth of talent this area has to offer. She enjoys playing pop covers in local joints, jazz standards at Sunday brunch, and cover songs for tribute shows. The multi-band special events, songwriting groups, and recording projects that pop up around Maryland are another thing she loves about being part of the fabric of this musical community. But her favorite venues are the small listening rooms that draw the avid music lovers who want to step away from the busy bars full of TVs and talk to get up-close and personal with the original music scene. Ultimately, this is what it's all about: sharing stories. Which leads us to the name of her newest release, Stories. The inspirations for the songs in this collection include her father's short stories about his childhood, her son's terrible twos persona, her daughter's move into adulthood, her own experiences as a working musician, and current political and social events. It's not a sermon or a memoir, but more of a reflection on her world – the things that she bumps up against on a daily basis. This is her favorite project to emerge from her 27 years as a professional musician and she's grateful to all the talented people who helped create it. Larry Melton and Brad Kimes are the rock-solid rhythm section with Ryan Cullen making a cameo appearance on drums for “Little Napoleon”. Meg Murray and Dan Haas perform beautiful backing vocals, Tim Stanley brings trumpet, Jennifer Krupa trombone, and Erin Snedecor cello. Topher Sisson brings his magic to acoustic and electric guitars as does Ahren Buchheister, who also adds accordion, melodica, dobro, and pedal steel to the mix. Ryan Cullen (Annapolis Audio Lab) did an amazing job pulling it all together as co-producer of the project. On Oct. 24 two Annapolis singers (and songwriters) Meg Murray and Angie Miller bring their three-part show to the cozy college town emporium, Andy's in Chestertown. Backed by a full band (Larry Melton on bass; Ryan Diehl on drums, and an unnamed guest guitarist), Murray starts the evening with a solo set of her urban contemporary tunes. A slender blonde with a voice that just keeps getting better, Murray was approached by producer Timbaland (Missy Elliott, Justin Timberlake's new solo release "Justified") a couple of years ago. She spent time in Manhattan recording with him but the project was shelved. "The deal fell through mainly [due to] timing. I was 30 going up against 18 year olds," says Murray. "I was with the right people, at the right place, at the very wrong time." The experience did open doors into the world of hip-hop, as well as give Murray insight into the music business and the studio process, which she says was "like going to graduate school." Once her contract with Timbaland expired and she regained control of her songs, Murray hunkered down in Annapolis with Todd Kreuzburg to produce her fourth album, "Ready," which she released in November 2002 on her own label, Girl Island Productions. The album's title track and "A Lover's Lament" - what Murray describes as the first happy love song she's ever written. "It's a wish" she says - can be heard on her MP3 page. The second set at Andy's will have Miller fronting the band. A wonderful songwriter whose 2003 release "Play" was recorded live at Sampsons Lounge in Annapolis (with Murray heard on background vocals), Miller established herself through several songwriters series. Her latest takes place every Thursday in November at Chez Lafitte in Easton, just down the street from the historic Avalon Theatre. Miller's first album, "Ricochet" released by the Big Mo label in 1996, included a cameo from the guitarist Danny Gatton and leaned toward poetic lyrics intertwined with pop rhythms. Her second album was "White Space," a lean acoustic effort Miller describes as "sparse and melancholy reflecting that time in my life." Her latest, "Play," has a fuller and buoyant sound. "At this point I'm really enjoying what I do," says Miller. "I get to work for myself, make music and work with talented people I respect. I feel blessed to be able to do that and that's really what it's about for me now." Miller's "Swim to Me" and "What's Wrong With Your Mind" - the latter based on a short story written by her father -- can be heard on her MP3 page. Angie Miller is back with a triumphant new recording. Like all the Annapolis players, this CD is a celebration of not only songs, but also musical friendships. The most pronounced connection is between Angie and good friend Meg Murray, who sings along throughout this eleven-song collection. The set was recorded live in Annapolis and the performance is polished. The backing band includes a sultry playing Larry Melton on bass, a laid back Ryan Diehl on drums, and a digital appearance by former Miller producer Topher Sisson. With the live mix, Angie's strummed acoustic guitar is up front and center. What is gained in this live recording is the immediacy and richness of Angie's voice and songs. There is a great Larry Melton bass line on " What's Wrong With Your Mind" and a triumphant climax " We Are" The whole concert has a natural flow to it, making it the perfect way to take Angie Miller home with you after the show is over. "White Space", the new CD from Angie Miller, reflects the heart of a singer in her own room, writing and strumming, strumming and writing, simple thoughts, dwelling in the stream of consciousness and daydream. If you've had the opportunity to see Angie perform you'll know the feelings. The new CD "White Space" reminds me of the journal style approach of Roseanne Cash's "10 Song Demo." On a number of songs Angie is lifted higher by some of her (and our) finest musical friends, Jen Smith of Naked Blue and Meg Murray on two songs apiece. The songs become playful when Angie's friends sing harmonies. Six of the ten songs were produced in Annapolis by Steve Alexander (Six String Sailing, Annapolis Christmas). One song is particularly vibrant, perhaps due to a live recording technique employed by longtime collaborator, guitarist/producer Topher Sisson. The final track, which first appeared on Six-String Sailing, is a lush instrumental named after Angie's lovely daughter Maxine and features Larry Melton on bass and Dan Cassidy on violin. I recommend that you go and hang out with Angie Miller on a few of her local dates and then take her home with you in the form of the intimate new CD "White Space." Wine has never been this intoxicating. "Homemade Wine," that is, as the all-lady's jam this past Monday at Café Orleans in Annapolis. As part of the Annapolis Song Writers Series, Homemade Wine is the second of an occasional series showcasing the talent of women musicians. Brewed up by Matt McConville, the name rises from Italian roots. "Italians used to make a lot of their own wine at home. It wasn't until I got older that I realized the wine we made, because of the time and love put into it, was always the best," said McConville. "Homemade wine is like homegrown music. It's the best." From the local musical vine, McConville handpicked some of the best female artists in the area. Gracing the cozy Cajun/Creole café stage were Angie Miller, Meg Murray, Mary Byrd Brown and Jen Smith. The four sat in a semicircle, each with an acoustic guitar, a mike and her own songs to play. With a quick "let's here it for the ladies" introduction, a musical round-robin began. Miller led each revolution. There is something about Miller's slightly husky voice that is inviting, even irresistible. She sings like a seasoned siren, stirring up a spicy gumbo of songs she'd composed, some loosely based on stories her father had written. A natural guitarist, Miller strummed with ease through "Here I Go," a strong, inescapable number that she cleverly wove a Temptations "My Girl" tease into. Next in line was Murray. The least experienced guitarist in the bunch, she announced that she was playing under "extreme duress." Murray made up for what she lacked in technique with what she has in soul, using creative chord progressions. Songs like the cool "Die Slowly" and the heart-wrenching "I Fall" resonated from her black ax like it was haunted. And can she ever sing. Murray has a voice that will bring tears to your eyes and joy to your heart. Not to mention she's got rhythm and solid percussive power. A high-five spun into Brown. Brown epitomizes the folk singer. Her songs seem to begin with simple ideas and evolve into grand voyages. "Birthday 99" begins with a phone conversation that turns into an epiphany. Her playing style, too, is cathartic. Intense and involved, she barely opens her eyes while playing, all the while hammering her guitar, stomping her feet, twisting and contorting her face like a woman possessed. In between songs, she's soft spoken, flighty even. The crowd seemed taken. Last, but certainly not least, in the rotation was Smith. A warm, soothing tone of voice made it easy to connect with Smith. Tunes like "When the Sun Shines Here" wrapped the audience in a dreamy world of "salty kisses," "walks in the high tide" and "swimming with the big fish." Smith was impressive on the guitar, she being the only one in the semi-circle woman enough to play leads. After about an hour of pickin' and a grinnin', the four broke to mingle with a captivated crowd of 50 or more. There was a buzz about how it was a refreshing change to see all women in the spotlight. Murray explains how jamming with men can sometimes feel like a competition. "The best thing about playing with all women is the sharing," she said. "Sometimes it's nice to have less testosterone and more estrogen on stage." A drink or two later, the relaxed bunch took the stage with a bonus. Suzanna Mallow, from the Salisbury-based band Redletterday, sat in for Murray to play both guitar and mandolin for the entire second set. Mallow was an immediate highlight. She rolled up the audience with a "thrash-grass" song that began with the lyrics "I get stoned with my mama every Saturday night." The round-robin continued for another hour, offering songs that ranged from paradise, love, lost love and fear, to memories, weed and Salvador Dali. Each musician added flavor to each other's songs by strumming along, tapping a tambourine, shaking a shaker or humming. The quartet wrapped things up with a Kate Wolfe cover called "Give Yourself to Love," inviting the audience to join in. The impromptu show went over with a bang. And the four, knowing it, exited the stage wearing smiles. "The show was very cool," thought WRNR station general manager Judy Buddensick. "It's nice to see the ladies in this town get some recognition." "As soon as possible," explained Brown. "We're talking about doing this again very soon, we just aren't sure where and when."